Oswald in the Doorway (not) : the blog of the Oswald Innocence Campaign,debunked by Lance Uppercut: So....Where are the photos Ralph...? 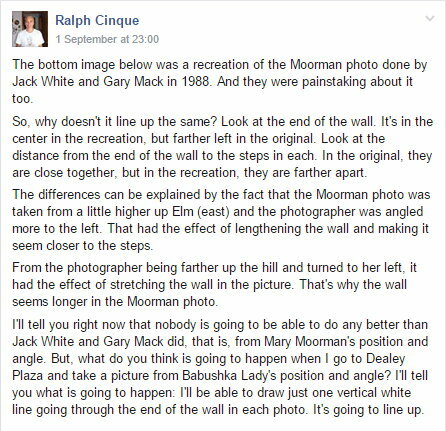 Despite the fact Ralph Cinque's claim that the Moorman photo was taken by the Babushka Lady has been proven impossible, Ralph, being Ralph, is still determined to persist with the lie. Obviously this is surprising nobody, so in this piece we'll expose a few more of his false statements about the Moorman photo and in the process attempt something which I fully expect to prove impossible - getting Ralph to give a straight answer to a simple question. and we can see in his piece that when the images are resized they actually match very well. the studies already conducted into the Moorman photo and provided links to detailed information about them. Ralph is desperate to have you believe that it's impossible to recreate the photo from Moorman's position, but the reality of course is that it's been done very well on more than one occasion. In fact both Jack White and Gary Mack produced reproductions of their own. Now we'll overlay it to the Moorman photo. Notice that the horizontal red line at the bottom of the photo demonstrates how far the photo has to be tilted in order to make the vertical lines of the pergola match the Mack recreation - this is because Mary didn't have the camera perfectly level when taking the picture. 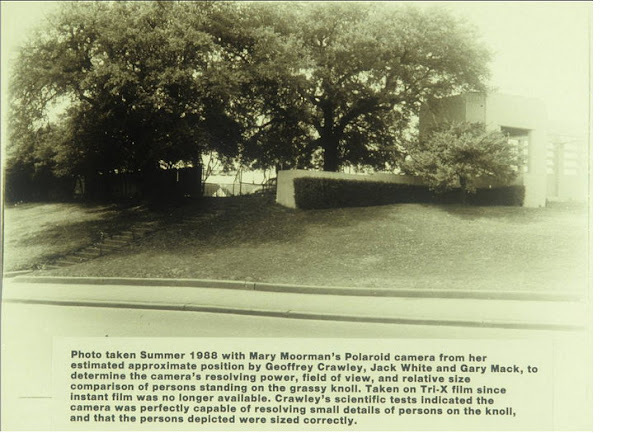 Now we can see that the Mack recreation is to all intents a near perfect reproduction of the Moorman photo...so much for Cinque's stupid claim that it wasn't possible from Mary's position. The truth is the exact opposite of course - Mary's position is the ONLY possible position the photo could have been taken from. When Ralph started to make these ridiculous claims he was of course blissfully unaware that Mary Moorman's exact position has already been the subject of close examination. And, what of Ralph's last paragraph, where he claims he will take a photo from the Babushka position which will perfectly match the Moorman photo? Well, he now says he didn't take it. 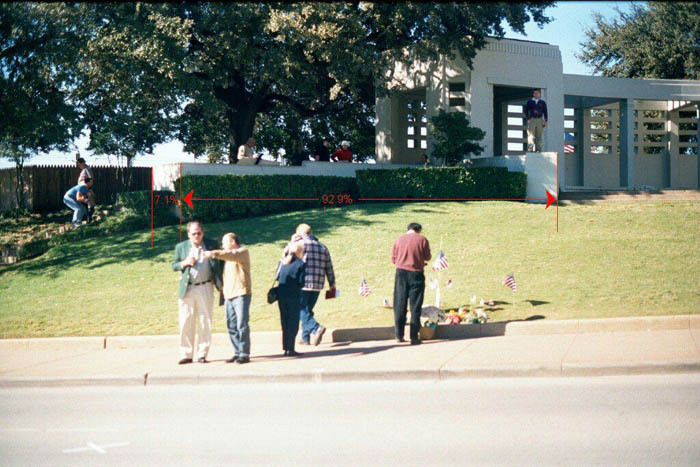 In other words, he wants you to believe that he travelled to Dealey Plaza with a camera after spouting endless piles of garbage on this subject for weeks, took a picture from close to Moorman's location and didn't think to move a few feet to his right to take the photo from where he claims it was taken. Does this sound even remotely plausible? Obviously the answer is no, so the question is....where are the photos Ralph? Of course, you can be absolutely certain that Ralph attempted to take the picture from the Babushka position. You can be equally certain that the results proved all of his claims about the Moorman photo to be false. Ralph, being Ralph, will continue to lie abut this, but lies are all he has left. Well…… where to end? It doesn't, Lance. Raff* is an existential nightmare. Thanks for keeping it real, though !! Great post ! Great post, Lance, with a thorough refutation of all of Ralph's claims. In his lame response of September 17, Ralph does one of the things he does best: change the subject! He now claims that the pedestal "facing" is wrong in the White photo, demonstrating Ralph's own lack of depth perception. And, of course, he does not make an attempt to answer your question above. In a post of September 16, Ralph invoked the name of Stephen Hawking, subtly linking himself and his unnamed physics consultant to one of the great intellects of the modern age. Unfortunately, Ralph misspelled Hawking's name as "Hawkings." And, by the way, where is any support for Ralph coming from the Oswald Innocence Campaign? Prior to his trip to Dallas, Ralph asserted that this was a group project. But the only other participant appears to be the "masked man" with face redacted by Ralph himself. That redaction speaks volumes about the true nature of the Oswald Innocence Campaign. 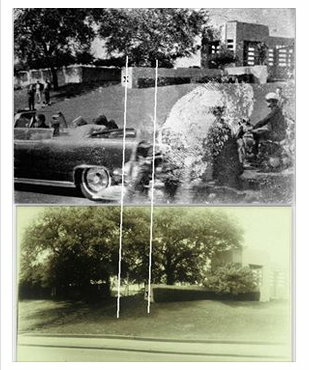 Essentially, Ralph’s Moorman photo exercise is just as flawed and unconvincing as his studies of Altgens6.